“Exploring Crete” is Peter Sommer Travels’ first scheduled tour in 2017. This year, to give an impression of the experience, we are providing a diary of sorts on our blog. Rather than describing every day in detail (you can check our itineraries on www.petersommer.com for that), every day we will pick one image we took that day, accompanied by some explanations and thoughts. Refreshed from yesterday’s free day, today we set out from Chania for one of the most scenic excursions on the entire “Exploring Crete” itinerary – and one of my favourite days on any of the tours I lead (often, my guests agree with this sentiment). This day was devoted to the rugged beauty of West Crete, to the White Mountains, the range that dominates this part of the island. The area is the part of Crete I know best, as the result of many weekend excursions while I was working on various archaeological projects in the region. It is a region I consider one of the finest in Greece, featuring stunningly majestic landscapes, broad vistas, lovely villages, lush and diverse vegetation and a dense scattering of cultural heritage. 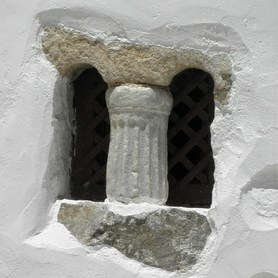 Our main cultural focus today was the ancient site of Lissos. If you have not heard of Lissos, that is understandable: the site is a small one, probably serving as the harbour settlement for one of the larger ancient cities inland from here, and it remains largely unexcavated. Also, it can only be reached by walking through a long gorge or by boat, so mass tourism has not even begun to touch it. 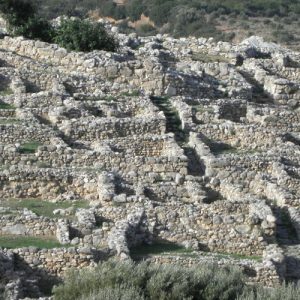 Set in a small and remote coastal valley, Lissos is a good example of what an archaeological site looks like in its “natural” state. 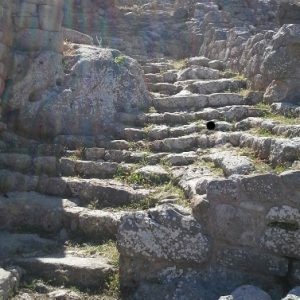 At first sight, there is little to see, but closer scrutiny reveals the basic features of an ancient settlement: a harbour wall, a series of paved areas and terraces, remains of shrines and perhaps houses, a mosaic-decorated temple, a barely-visible theatre-like structure (is it a council chamber? ), a whole series of house tombs, several Early Byzantine churches and endless amounts of ancient potsherds, including bits of roof-tiles, storage or transport vessels, cooking wars and table wares. It is the ideal place to show our guests hands-on how an archaeologist identifies a site and its constituent parts in the field. Our picture, look closely, shows the chapel of the Panagia (the Virgin Mary), incorporating a lot of spolia and sitting within the remains of a much larger early church. What I love is its bell, hung in nearby olive tree. Lissos is not spectacular, but it is instructive, intimate and intensely atmospheric. It is a key experience on our tour of Crete, a place that gives copious pleasure to its visitors. We expanded on such pleasure by offering a lovely beach-side lunch, and later a superb dinner in one of the best seafood tavernas of Chania.